In the first part on How to choose your Next Employer we talked about the steps you must take when picking up your future employer. We talked about the research you should make – gathering information both provided by the company itself, as well as details from present and past employees, how to interview the interviewer and about the trial working period. 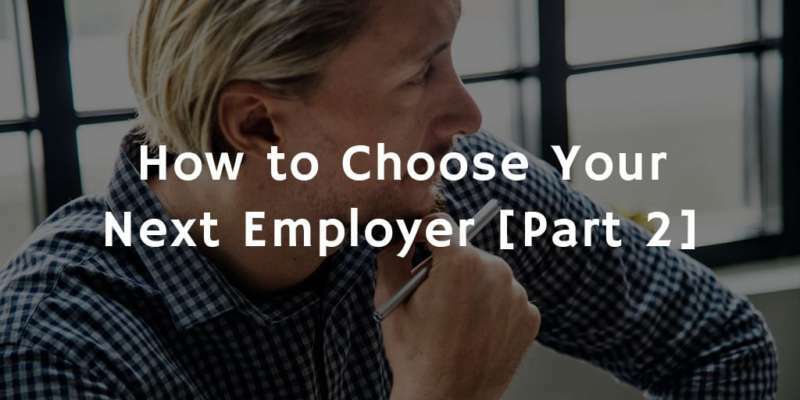 In this post we will dig deeper into the uncharted waters of being the decider, when you are a job applicant. We are about to explore which information to concentrate on and what kind of questions to ask. We already mentioned in part 1 of the topic that when you read the company website, brochure, social media profile and recruitment campaign information you will quite possibly come across the company values. Every industry has its own unique and particular values, but if we have to talk about such company values distributed among all industries and organizations, there are a few most common – teamwork, superior customer service, lead by example, operational excellence and being accountable for results. As you can see these values speak more about the company’s expectations from you, rather than what the company offers to you. Actually, most job advertisements go very similarly – providing a long list of desired skills and achievements and a short paragraph of benefits. Whether the company cares about its employees and puts efforts into retaining them you could learn from two sources – a statistical research on the employment flow, or otherwise said how long do the employees stay at that particular company and how often does the company hire new employees. An alternative to the first source is following your local employment website – if the company has advertisements constantly, this is a bad sign. The second source are the past and present employees. Most commonly people work in order to get remunerated for their effort. Today many companies employ the strategy of a basic remuneration and a bonus scheme plus some additional benefits. This is done in order the company to make sure its employees are well motivated to be high-performing. You should be confident your basic payment is going to be good enough, so in case you are on holidays or on a sick leave and you are not going to get a bonus, you will still do well. Also make sure your basic payment will be delivered on time, in a preferred by you mode. Undesirable payment method may be working only with a particular financial institution or just cash payments. As we just mentioned the basic payment nowadays makes just a part of your entire remuneration and you must research also what additional benefits you will be offered. Usually, this is the point where one employer gains advantage over another. Make sure you check out whether the bonus scheme includes achievable targets and how often the target changes. additional health insurance and many more. Obviously, it is very important to know what are you going to do for your next employer and where are you going to it. Pay attention to your schedule – are you going to work on shifts? Will you have night shifts? Are you going to get the opportunity to rest during your night shift? Are the night shifts going to be paid extra? Are you going to work in the weekends and rest some of the weekdays? Then, what are your working hours going to be? The usual duration of a working day is 8 hours, which includes two 15-minutes breaks (according to the most European countries’ work legislation) and additionally you get 30-minute or an hour long lunch break, so you would be at work about 9 hours in total. Is it expected from you to stay overtime? How often? How long? Will you be sufficiently remunerated for that? How in advance will you be warned about the need? Can you decline, if you already have something planned? And lastly – the holidays. How many paid holiday days will you get? If the work nature is such, that you are supposed to work on the official holidays how will you be remunerated for that – extra paid days off, or double/triple payment? If you are working in an office – are you going to work on a desk in a big room with others or will you have your own office? Will the office be air-conditioned? Is the office-building nearby your house, or will you have to commute a lot? Will you be offered traveling expenses allowance? Will you get a company car? Would you be able to use the car for personal needs? Is there a lunch place nearby which offers food to your liking and needs? It is of great importance, that you will be provided with all of the instruments, needed to perform your job and be efficient. This is very particular for every single job, so depending on what you are applying for it is advisable that you create a list in advance and have it handy. As an example, if you are going to perform a job at a computer, make sure it is well-equipped enough and has all the necessary software installed. Perhaps the most difficult information to gain beforehand is the company hierarchy, what exactly will be your responsibilities and rights. The best source is your successor people working at that department and in that team.